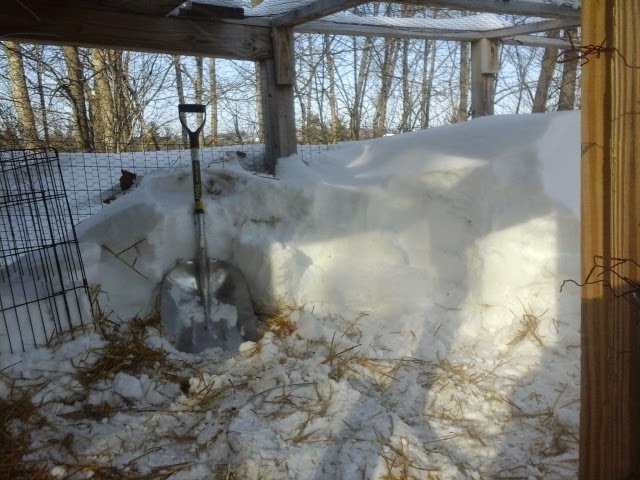 During winter, with snow covering everything so deeply ( this winter we estimate we have received close to 8 feet already) there is no way for chickens to free range. If we had horses or cattle in a paddock, they would tromp everything down pretty quickly and there would be at least some open areas for chickens to forage. Without that help, we are forced to explore other options for getting fresh food for the Hens. its not too diffocult right now with only 6 layers, but eventually we will have several dozen and feed costs can skyrocket. For our homestead, the goal is to become self sufficient in providing food for the chickens and elimimate store bought commercial feeds as much as possible. If chickens were left to themselves, I believe their choice of diet would look like this : about 75-80% live protein (bugs, worms, etc. ), 10-15% greens, and only maybe 10% seeds or grains. I chuckle at the egg cartons at the market that tout "vegetarian fed", as if that's a good thing. Chickens are not vegetarians. For a small scale homesteader, there are several possibilities, and I am particularly interested in implementing the following. Rotating compost piles as main source of food during spring, summer, and fall. More about this method in another post. Growing and storing silage for winter feed. (Silage is basically green plant material that is enclosed in an airtight container (think silo) and allowed to naturally ferment. It has advantages over hay both nutritionally and in processing that I can talk about later. This of course is also an option for feeding ruminants such as cattle, sheep, and goats. It is scalable for a small homestead such as ours. Raising worms. super easy, low cost, low maintenance, and a great source of protein for chickens. Sprouted fodder. I am doing this now by sprouting seeds for them. The problem is that it involves store bought seeds, and I am trying to implement as much home grown feed options as possible. Could I grow a small crop of barley or oats for this purpose? Maybe. These are some ideas. The long winter months really require creativity if self sufficiency is the goal. Of course, all this snow does function as a second freezer. 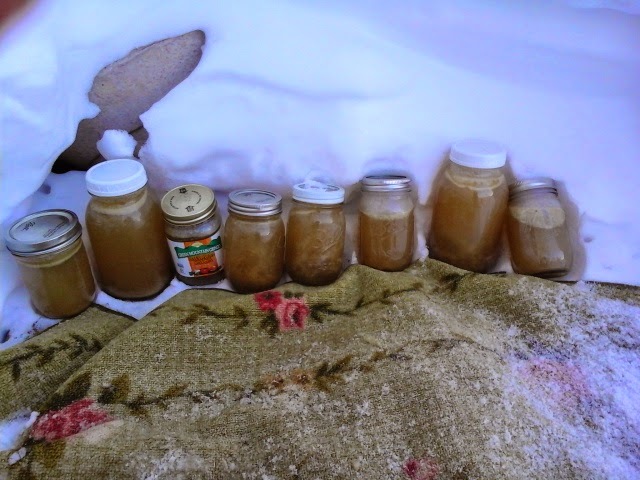 Here my jars of vegetable broth are freezing out on the front steps. I dont have freezer space where they can freeze in an upright position, but once frozen, i can toss them in without a problem. Weather: sunny, after some snow flurries yesterday. Minus 5 this morning.